Pass the chocolate, it’s time for dessert. Let’s face it; Valentine’s Day is a thinly veiled excuse to eat the good stuff. Although to be perfectly honest, I rarely wait for a special occasion to treat myself. I consider chocolate as much of a kitchen staple as I do good butter, eggs, coconut milk and sea salt and you’ll never find me without. 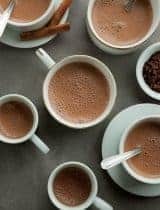 My pantry overflows with various odds and ends of bittersweet chocolate and bags of raw cacao and nibs all year long. Rich and velvety, it soothes my senses and delights my taste buds like nothing else. I’m quite certain chocolate may be one of the best things on earth. Luckily I’m not the only one who agrees. 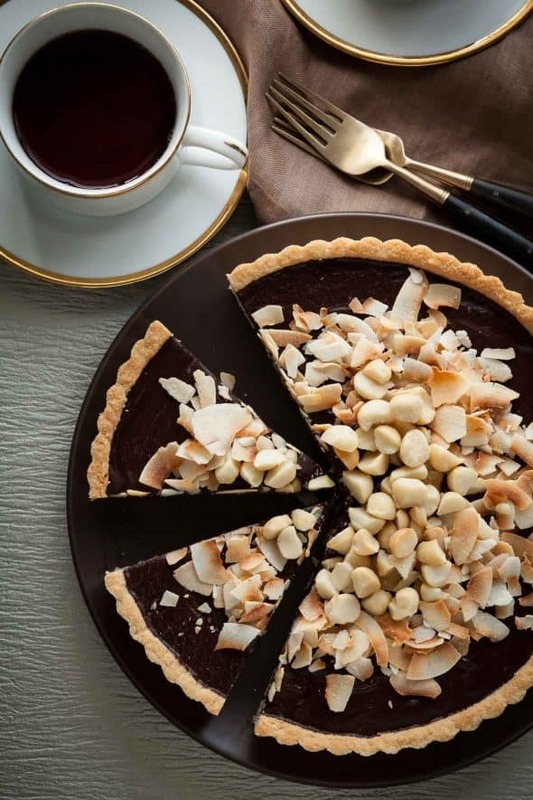 This chocolate coconut tart is dense, silky, utterly simple and guaranteed to fulfill your chocolate cravings. 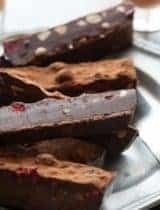 Dark chocolate is the star, but coconut plays a significant supporting role in three separate forms: shredded, oil and milk, so coconut lovers will rejoice as well. 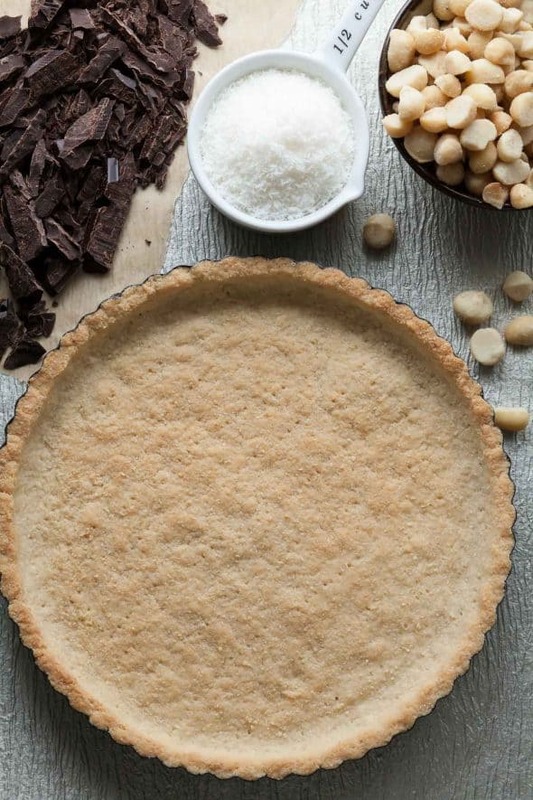 A shortbread-like press-in crust made with almond flour and shredded coconut is baked off and filled with a quick coconut milk ganache, then chilled until set. 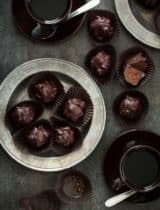 Lightly toasted buttery macadamia nuts and even more coconut top the glossy slick of ganache; the crunchy texture of both contrasting nicely with the smooth, velvety filling. Finally, the intensity of the rich bittersweet filling is rounded out with a small pinch of sea salt scattered across the top. While this tart works well for any occasion, it’s an awfully good way to end a romantic meal. Cacao is one of nature’s best sources of magnesium; a mineral most of us could use more of. Dark chocolate contains antioxidants similar to those found in red wine and tea. The consumption of dark chocolate has been shown to increase insulin sensitivity and decrease blood pressure in healthy people. Studies have shown that chocolate consumption can reduce the risk of dementia and enhances cognitive function. Chocolate could improve your math skills. Preheat oven to 350 degrees. In a food processor, pulse together almond flour, salt and shredded coconut until finely ground. Melt together coconut oil and maple syrup and add to almond flour and coconut mixture, pulse until coarse crumbs form (dough should clump together when squeezed with fingers). Bake in center of oven until golden and firm, about 15- 20 minutes. Transfer to a wire rack to cool completely, at least 1 hour. Spread the chopped macadamia nuts and shredded coconut evenly over a sheet pan and bake until lightly golden (about 3-5 minutes). Set aside. Pour chocolate into cooled tart shell. Lightly sprinkle toasted macadamia nuts and toasted coconut across the top. Sprinkle with a pinch of flaky sea salt if desired. Chill for at least one hour or until set and serve. Gorgeous, absolutely gorgeous! And your words "This chocolate coconut tart is dense, silky, utterly simple and guaranteed to fulfill your chocolate cravings." say it all, don't they? Whoa, this is just stunning! 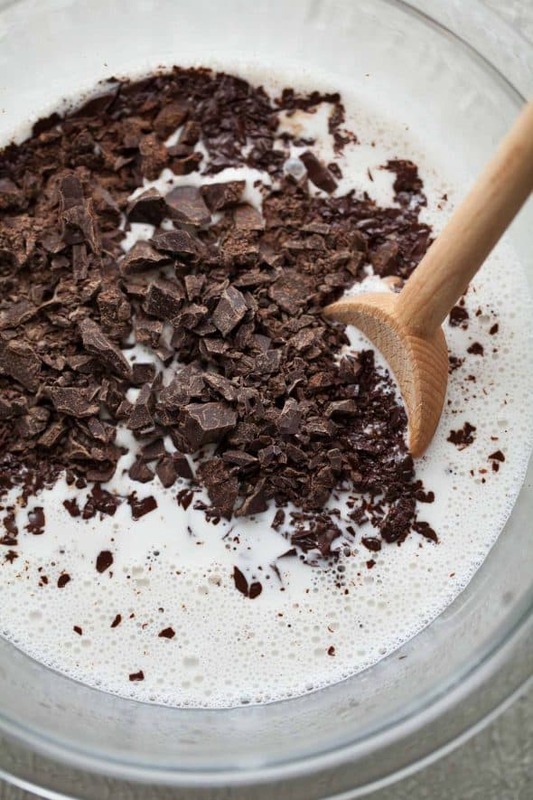 Silky chocolate plus coconut sounds heavenly!!! We too use Valentine's Day as an excuse to eat really decadent dishes... and this tart totally hits the spot! Absolutely gorgeous! if your photos didn't convince me I need to make this......those reasons to feel good about eat chocolate sure did!! looks fantastic Sylvie! We absolutely love tarts like this, but your topping takes it over the top, Sylvie! Love it! And... love all those reasons for loving chocolate even more than I already did. This looks absolutely sensational and utterly decadent. Good thing it's healthy too! I love all the ingredients and this would be a perfect Valentine's day. Simply divine! This tart looks divine. All of that lovely chocolate (that is, of course, very good for you) and toasted coconut. That has to be one of my favorite flavor combinations. Recently I've been toasting up coconut flakes and sprinkling them with coconut sugar while they're still warm. What a treat! That sounds delicious, I like to toast mine with some cinnamon sprinkled on top too. Love the looks of this tart. I can't wait to share with my GF friends (and of course make one for me too)! I don't know how much of the ganache would actually end up in the tart if I made this--I think I'd just eat it straight out of the bowl! A thing of beauty! Everything you make is so poetic. I will definitely be trying this! I am quite the lover of making tarts but have yet to tackle gf crust. This one looks great! They are so much easier than traditional crusts, just press-in and bake. Gorgeous tart, Sylvie! I never say no to chocolate :). Gorgeous and filled with amazing ingredients. This is happening for Valentine's Day! That looks gorgeous! Your photographs are stunning. I didn't realize that chocolate could be paleo - intersting. This looks utterly wonderful - indulgent yet full of essential nutrients and not too much sugar either. Gorgeous! Stunning! 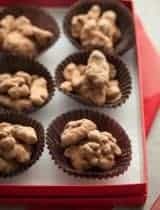 The macadamias and the coconut are such a wonderful complement to the chocolate! So good! 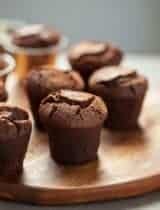 You always create the most gorges recipes using chocolate! This one is no different. This is way to perfect! I never wait to treat myself either. I say do it and enjoy it. Sylvie, you are not helping with my chocolate addiction problem :). It looks delicious! Beautiful! This tart looks so luscious... I just love the fragrance of toasted coconut. My grandmom use to make simple blend of fennel seeds, toasted coconut and sugar crystal to nibble... This Tart is fabulous... How can anyone say no to chocolate. This looks so scrumptious. And I love that you made the filling with coconut milk. I mean who can say no to chocolate? I love a crust recipe that doesn't need any rolling. This is going in my wish list. Totally amazing looking. I always think macadamias are like the daddy O nut...best crunch and best flavor! This is my favorite V-Day dessert I've seen yet! All my favorite ingredients in one delicious dessert. I voted for you in the Homies. You definitely deserve to win! I am so late to the game and only just realized it was Homies time... oopsie. We both are on the same chocolate high ... as I said on my latest cure chocolate has mystical powers and is the cure to all. I think I am ready to swap you a slice of this heaven in a cake for a few of my cookies. Deal? Absolutely lovely Sylvie! I love your crust recipe. Oh, Valentine's Day means you can totally indulge on chocolate! I could dive into that tart - mind, body and soul! Those nuts on the top are simply to die for. Love this, Sylvie. Decadent and delicious! Sylvie - what a beautiful tart for Valentine's Day or any special occasion! Love the crust recipe. I made this tart for dessert last night - stunning and outrageously decadent! I'll be making it again soon. Thank you for sharing such a lovely recipe! I, too, value chocolate as a valuable kitchen staple. This tart looks amazing. I am going to try this crust with my little Valentine cheesecakes. Great food styling and composition on that top shot! Really good. And this tart looks really good too - terrific, actually. Love everything about it - thank you. Simply gorgeous and stunning beauty, Sylvie! Not only I want to eat this tart, but I want these pictures too! what a beautiful tart, Sylvie!! I love the combination of chocolate, coconut and macadamia! This is really dessert done right. And chocolate as health food? Yep, I'm in! I just adore the way this tart looks. I can only imagine how delicious it is! Sylvie, Love macadamia nuts and this one seems like an indulgent tart! Especially like your coconut milk ganache. I just pinned this! It looks amazing and PERFECT! Can't wait to try it out. Ha- I don't need an excuse. If I did then it's Valentine's everyday! Love this recipe, especially the crust. It's true butter and chocolate are staples in our house too. 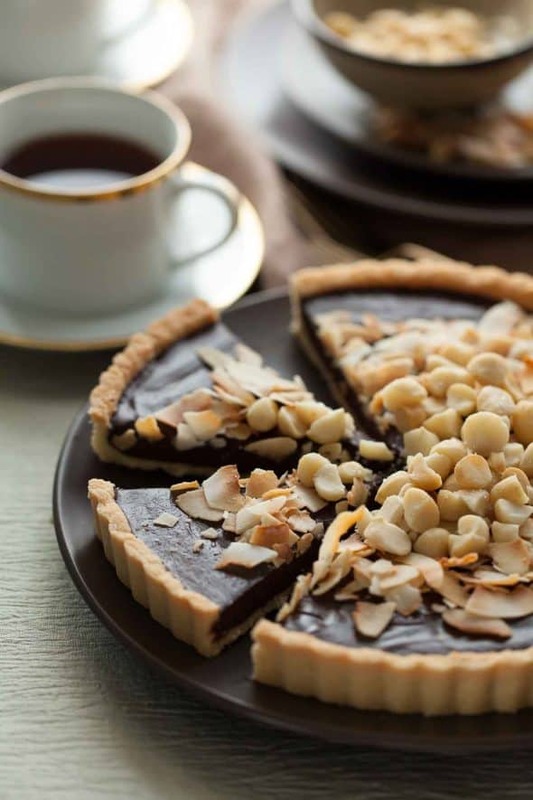 I like the combination of macadamia and chocolate in this lovely tart. Yes to this and I have friends that would swoon as they are such chocolate coconut fans. This tarte looks amazing! Love the combo of sweet softness and crunchy nuts! Wow. I made this tarte this weekend and it must be one of my all time favourite flavour combinations. Heavenly! Thank you for the inspiration! This tart is adorable! Dark chocolate is a perfect choice! I generally prefer fruit tarts, but this one looks so tempting! The topping turns it into a star of any occasion to celebrate! Definitely a must try recipe for me! It is taking all my willpower not to feign sickness/ walk out of the office/ go home/ start baking this. I even have all of the ingredients. As you say, who would be without a cupboard staple of dark chocolate? Hurry up weekend. I need you. Wow your tart looks amazing! I'm so impressed with the ingredients list too! Madly in love with this recipe. I am going to make it for a friends party tomorrow. Go Paleo! This is a fantastic recipe for a winner of a chocolate tart/cake using very good healthy ingredients. I have made this twice and look forward to making it many many times in the future. 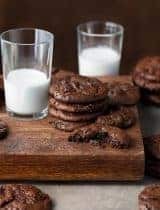 The result is a very rich creamy truffly chocolate density with all the ingredients in full complement with each other. The first time I didn't have the nuts so I subbed in finely chopped candied citrus peels (homemade by me :) and my bf loved the intensity of the chocolate sooooo much that I made it again for his birthday, as his birthday cake (his 12-year old loved it, his 9-year old was overwhelmed -- which is really funny cause the younger boy is usually the chocolate fiend). My second attempt I followed the recipe exactly, except I soaked the macadamias for 12 hours and then toasted them -- killer delicious. I made my own coconut milk from dessicated coconut. My almond flour is Bob's Red Mill. Not owning any springform pans, both times I used a glass dish -- the first time a glass tart pan and the second time a glass pie plate. The crust didn't come out very easily, had to carefully cut and scrape it out with a knife, which is no big deal. I went very liberal with the coarse sea salt, which makes this a very sophisticated desert. I must sing high praise to this recipe and the recipe-innovator. Kudos!!!! That's wonderful, I'm so glad you all enjoyed it! Hi Sylvie, Thanks you so much for the recipe. 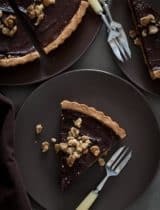 I love anything chocolate ganache and no, I do not need a reason to make this tart over and over again! Just like I tell everyone - gluten free, vegan, no sugar - practically guilt free!! Does the maple syrup in the crust do anything but sweeten it? I would like to make this for my pot luck Thanksgiving celebration, but I would rather highlight the ganache instead of the crust. Can I omit the maple? The maple adds a very subtle sweetness to the crust that honestly doesn't detract from the richness of the ganache. If you were to omit it the crust would taste more like that of a savory tart or pie and would in my opinion wouldn't be quite right for a dessert. Hope that helps! I love hearing that, that's the best kind of compliment! I'm really glad everyone enjoyed it. Sounds divine! Did you use canned coconut milk? Yes, the full fat kind. This is making me hungry. I will have someone make it for me. I made this for an office birthday today, and it was a huge hit among a crowd of picky eaters - gluten free, dairy free, avoiding refined sugar, etc.! Just gorgeous for a special occasion, but VERY easy to make - thank you! This also looks as though it is kosher for Passover - yay! I'll try this out for our seder. Hi Sylvie, this looks absolutely divine!! I want to make this for a work colleague's birthday next week but will only be able to make it 24 hours in advance. Will the crust go too soft in that time or should it be ok? Thank you for this beautiful recipe! Hi Jacqui, Yes the crust will soften a little once the chocolate filling is added but it should still slice pretty well 24 hours later and won't affect the flavor. I hope you all enjoy it! I always love hearing that! Hi there. I tried this beautiful tart last night for my family and ran into a couple of challenges. First of all the crust was incredibly sticky when I went to press it into the tart pan -- do you have any idea why that might be? Second, my tart didn't set, even after being in the fridge for 4 hours. I'd really like to try this tart again because it's absolutely beautiful and my family has a lot of dietary restrictions (vegan, gluten free) so any insight you have would be so appreciated! Thanks! The dough should be wet enough to push around the tart pan easily but not sticky so I'm not sure why yours would be. Maybe cut back a little on the maple syrup and see if that helps. It should set up and be firm after an hour or so. Hope that helps! I made this yesterday with my granddaughter for her birthday cake. "Not too many macadamias Mimi!!" she warned me. Yeah, is there such a thing? My question is regarding the leftovers. How best to store the leftover piece? Will it freeze alright ? I have to say it is so rich but i added homemade coconut whipped cream and that for us took it right over the edge …so creamy, rich and delicious every bite!! Hi Suzi, I'm so happy to hear you enjoyed it! As for the leftovers, they are best kept in an air-tight container in the fridge and brought back to room temperature before serving. It will keep quite well in the fridge for at least 3 to 5 days. Love this recipe! How long will this tart last without getting soggy? It won't ever get soggy but the crust will soften a bit if you put it in the fridge which I'd recommend you do if you are planning on keeping it for more than a day. Hope that helps! Hi Sylvie, I'm excited to try this! 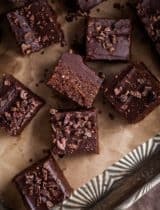 What are your thoughts on using cocoa powder or cacao nibs instead of bittersweet chocolate? Hi Erin, You can use the filling from this tart: http://gourmandeinthekitchen.com/chocolate-date-caramel-walnut-tart-recipe/ if you'd like instead (it uses cacao powder), but you'll need to increase the quantities a bit since you'll need more of it to fill the entire crust without the date caramel layer underneath. Hope that helps!